Barrier Coat II forms a barrier between lead-based paint and the environment to offer unparalleled coverage, economics and aesthetics while preserving historic and architectural detail. Barrier Coat II complies with all EPA and HUD requirements and was found in independent testing to meet and surpass the ASTM E1795 standard for lead-based paint encapsulants for both indoor and outdoor use. Thoroughly mix Barrier Coat II prior to application. Clear liquid present when container is opened is an integral part of the product and must be mixed in completely. 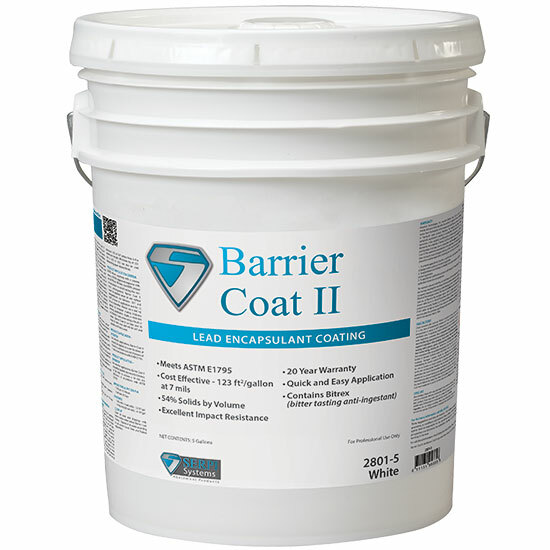 Barrier Coat II is supplied in a tintable white base, and may be tinted to light colors with two ounces or less of universal liquid colorant (per gallon) by an authorized distributor. Prior to application of Barrier Coat II, inspect all surfaces to ensure they are clean, dry and free of all contaminants including: dust, rust, grease, oil, mildew, glue size, calcimine, wax, soap, loose paint, or any other surface contaminant which may affect adhesion. Patch and repair irregularities in surfaces with appropriate patching compound. Fresh plaster, gypsum board, wood or any porous substrate should always be primed, and follow manufacturer’s recommendations, including cure time. For high gloss or newly painted surfaces deglossing is required. For detailed surface preparation and application instruction, please refer to Barrier Coat II Specification available at www.serpisystems.com. Prime unpainted metal surfaces with a 100% acrylic rust inhibitive primer. Prime water damaged surfaces with at 100% acrylic stain blocking primer. Prime unpainted wood and drywall with a 100% acrylic universal primer. Prime unpainted brick, masonry or block with a masonry conditioner. Prime chalky surfaces with a chalk resistant primer. Apply with brush, roller or airless spray equipment. Care should be exercised in selecting the proper equipment. All wetted parts of the spray pump should be specified to resist abrasion. The use of high density polyethylene seals in place of the standard PTFE seals will greatly extend the service life of the pump and reduce downtime. Spray using equipment capable of 2500-2800 psi and a minimum output capacity of 0.5 gallons per minute. Remove inlet filter strainer, outlet filter and filter support. Set pressure to minimum 1,000 psi tip pressure, 100 of 3/8” airless hose is the maximum length. Minimum tip of .021 but a .023 or .025 can also be used depending upon desired finish. GENERAL NOTE: When applying with a sprayer, wear a NIOSH approved respirator with any R, P, N or HE filter. Use HEPA canister on respirator to avoid tasting the nontoxic anit-ingestant. Barrier Coat II must be applied when air and surface temperatures are between 50°F and 95°F at time of application and for 12 hours thereafter. Always use a wet mil gauge to measure coating thickness during application. Apply a minimum of 2 liberal coats when using a brush or roller. Barrier Coat II can take over 30 days to fully cure and will be soft and pliable until fully cured. For interior applications, Barrier Coat II should be applied at a wet thickness of 13 mils to achieve a dry mil thickness of 7 mils in accordance with ASTM E1795. For exterior applications, Barrier Coat II should be applied at a wet mil thickness of 26 mils to achieve a 14 mils dry thickness in accordance with ASTM E1795. Clean all tools and drippings with warm soapy water before Barrier Coat II dries. Dispose of all waste according to all current local, state and federal regulations. Close container after each use. Product is sensitive to heat and time. Store in a dry place at temperatures between 40° F and 100°F. Do not store at temperatures in excess of 100°F. Rotate stock often. Use product in a well ventilated area. If respiratory irritation develops increase ventilation and/or wear respiratory protection. Use a disposable spray-mist/dust respirator rated for filtering aerosol mist to avoid oral contact with bitter tasting, anti-ingestant ingredient when spraying. Avoid contact with eyes and skin by wearing safety glasses, gloves and protective clothing. Wash hands and face before eating, drinking, etc. 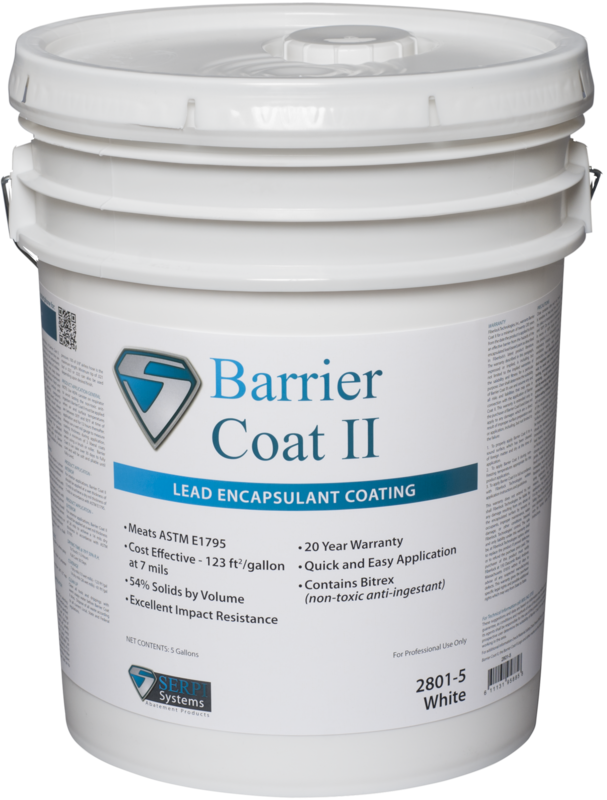 Barrier Coat II will not protect occupants from ingestion of the encapsulated lead-based paint, if surface is damaged, broken or abraded. Surfaces coated with Barrier Coat II must be inspected routinely. Damaged surfaces should be repaired and re-encapsulated immediately to prevent exposure to the lead hazard. Not recommended for use on friction or impact surfaces, or movable closures such as door jambs and window jambs. Residents may be present during brush or roller application but not in the immediate work area (i.e., same room). Residents should not be present during spray application for worksite safety reasons. Residents may return once application has ceased and Barrier Coat II is dry to the touch. Refer to the Safety Data Sheet (SDS) available from your distributor or at www.serpisystems.com for further safety and handling instructions.